Love Chip’s Family Restaurant so much that you wish you could take it with you wherever you go? We don’t blame you and we can guarantee you’re not the only one thinking this. Well, we’ve got some good news – we offer a vast catering menu so let us take care of your next party or event! For starters, we offer some delicious breakfast staples including a continental breakfast for those who prefer a more grab-and-go style, hot breakfast options such as our famous pancakes, French toast, eggs, bacon and sausage, and more exquisite options like Breakfast Enchiladas, casserole and assorted sandwiches. We also offer fresh fruit, home fries, Vermont real maple syrup and corned beef hash, too! Our catered lunch options include things like assorted wraps with your favorite deli meats and a variety of hearty sandwiches including turkey, ham, tuna and more! 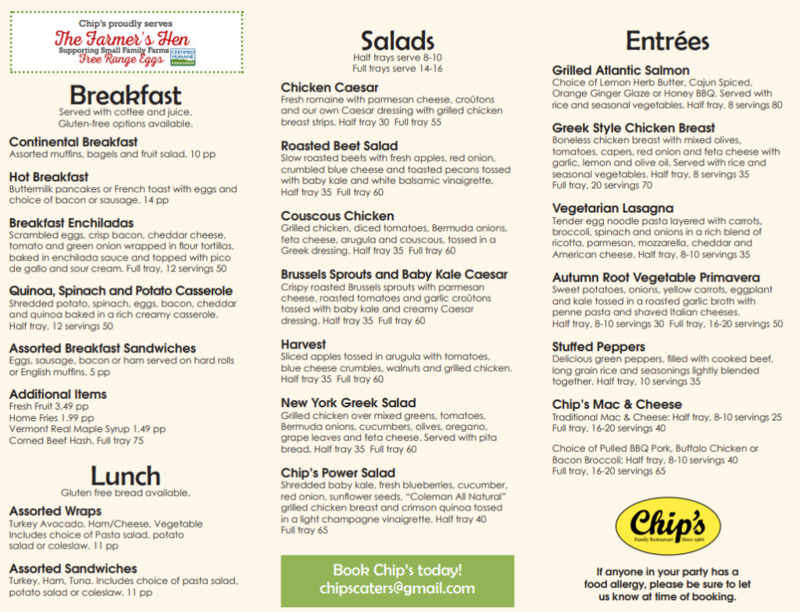 Each lunch option comes with a choice of pasta salad, potato salad or coleslaw. Looking for a catering option on the lighter side? We’ve got plenty of salads to do the trick! A half tray serves roughly 8-10 people and a full tray is perfect for up to 16 people. We’ve got everything from the classic chicken Caesar to roasted beet salads, kale salads and everything in between. From grilled Atlantic Salmon to Greek style chicken breast and Chip’s Mac & Cheese, we’re covering just about all of the bases when it comes to main courses. We also offer pulled BBQ pork, Buffalo chicken and bacon broccoli in half or full trays. Not to mention… we’ve got our very own pancake food truck! Lil’ Chip is here to bring all the fix-ins to you, where you happen to be!